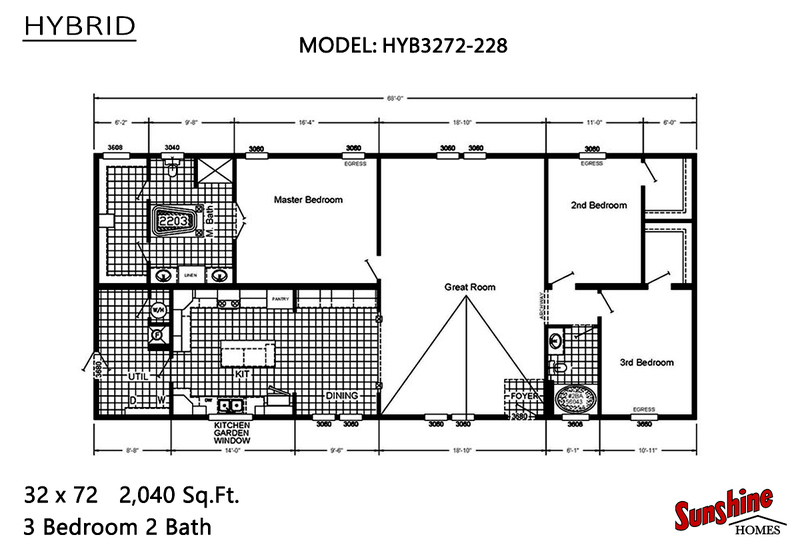 This floorplan is currently unavailable or has been discontinued by the manufacturer, or this page is in the process of being updated. Hybrid HYB3272-228. Open concept plan with massive great room that opens into dining room and extra sized impressive gourmet kitchen with almost 40’ of lineal lower and overhead cabinetry and counter top space with additional work space and serving island. Built in hutch in dining room and garden window over kitchen sink. Exterior Wall On Center:16 in. Interior Wall On Center:24 in. All sizes and dimensions are nominal or based on approximate builder measurements. AA Manufactured Homes reserves the right to make changes due to any changes in material, color, specifications and features anytime without notice or obligation.